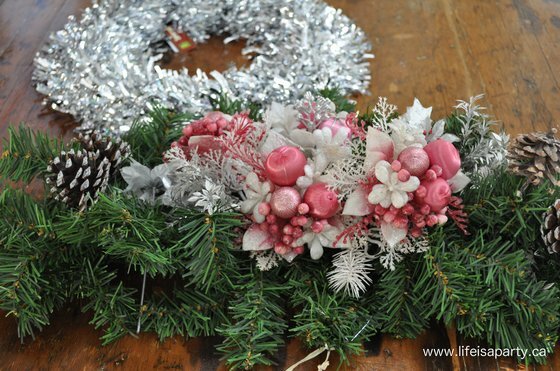 Vintage Christmas Ornament Wreath: How to make a beautiful Christmas wreath out of vintage ornaments. 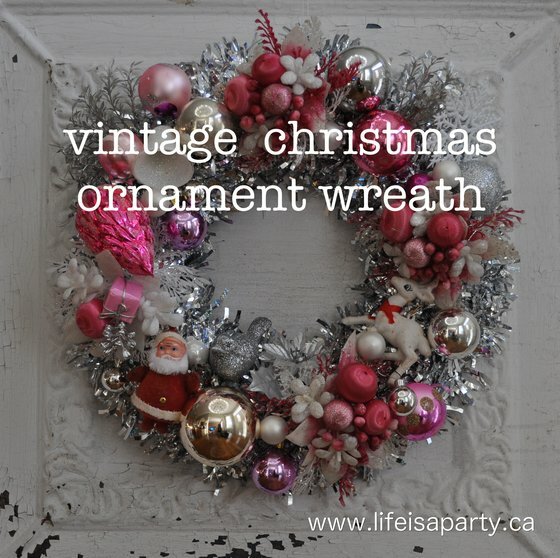 If you follow me on facebook, you might know I’ve decided to go with a vintage inspired Christmas theme this year. After shopping for vintage ornaments this weekend, I was feeling a little worried. They’re tricky to find, to put it mildly. I did have some already. And over the next few weeks, I’m planning to visit my local thrift stores on a very regular basis. As luck would have it, I did manage to find some on Friday. I visited a fairly new thrift store nearby, and since this is their first Christmas to be open, it seems they were saving up Christmas items until the day after Halloween. 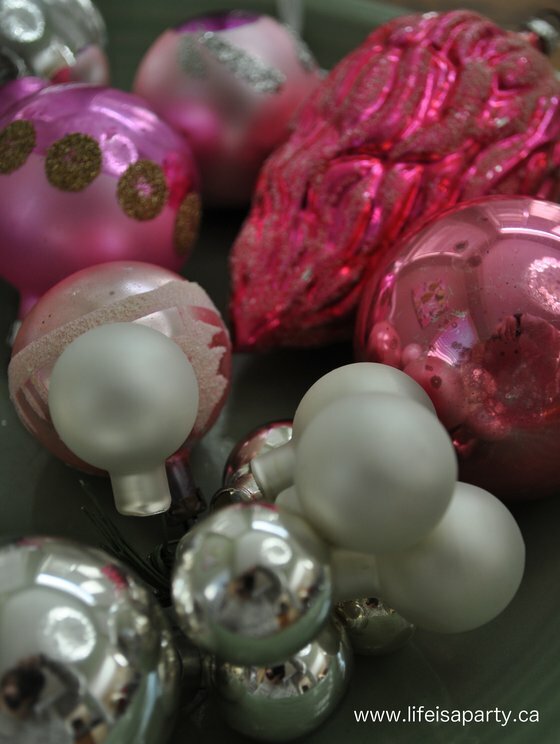 I didn’t find the beautiful glass balls I was hoping for, but I did pick up a few vintage plastic ornaments. 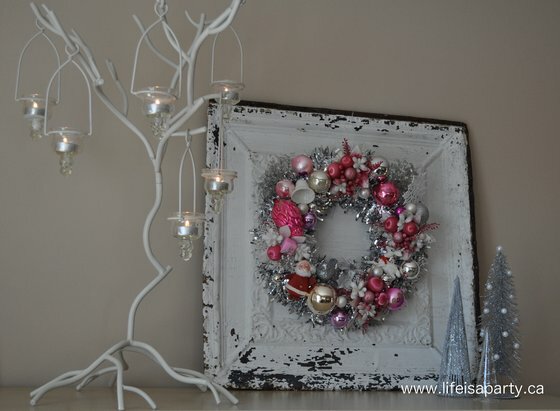 They weren’t in mint conditions, but grouped with other things on the wreath is the perfect way to hide their flaws. I was inspired by this piece with the pink satin balls. It was .49 cents…and I could see the potential. I remembered that there were tinsel wreaths at the dollar store for 2 bucks. One other little trick, I used white floral wire to attach everything, so it isn’t permanent, if I want to remove the vintage pieces later I can. I love how it turned out. After feeling earlier this weekend that maybe I should have gone another direction for my Christmas decorations this year, I am now fully sold on the vintage direction. I’m also convinced that it doesn’t need to be all vintage. I can take my few old pieces and showcase them, and mix them in with some new vintage inspired pieces, and some other plainer pieces. 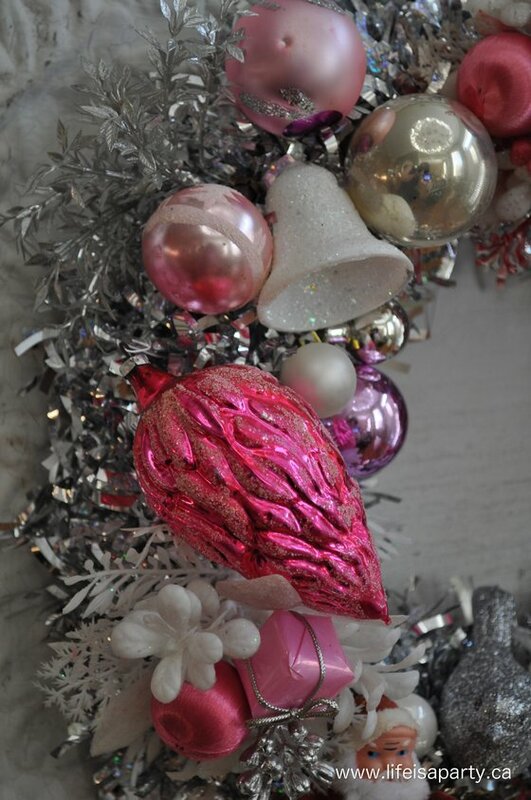 With a pretty, pink, shiny Christmas wreath like this, life really is a party! What a cute idea!. I love it so much. I love and adore this!!! Especially in soft pink. I’m reminded of my grandparents beautiful old ornaments. 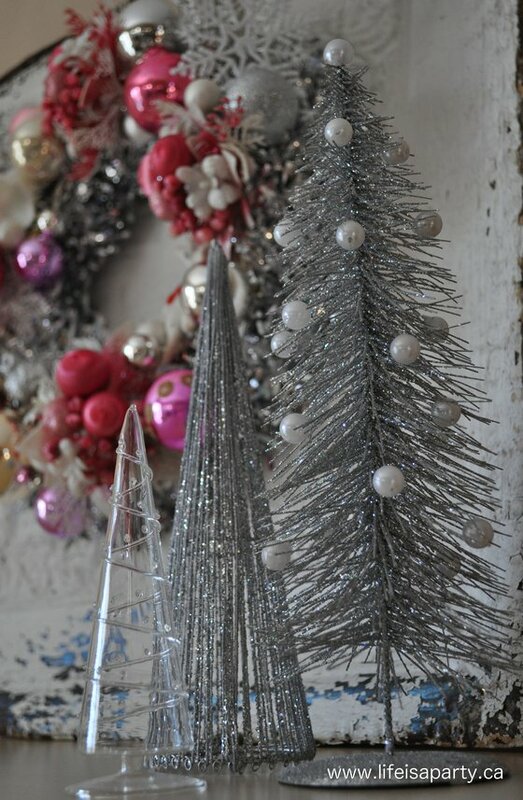 Dude – this post has me jazzzzzzzed for holiday decorating! Absolutely beautiful! Love how you’ve placed it on a vintage looking plaque. Is that made out of wood? 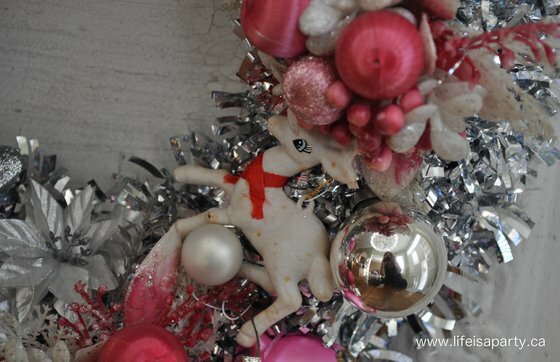 Looking forward to more blessed Christmas awesomeness from your wonderful blog! Thanks Sabrina, it’s on an old tin ceiling tile that I found at an antique market. Lots more Christmas posts on the way, hope you enjoy! Fabulous! 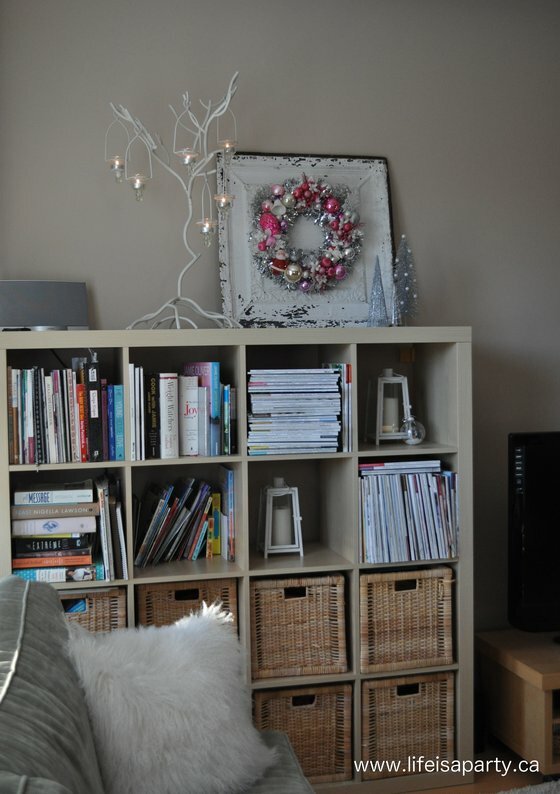 Your gorgeous wreath was my favorite decoration on the Holiday Idea Exchange. Can’t wait to try it! Merry Christmas!